All My Children (often shortened to AMC) is an American television soap opera that aired on ABC for 41 years, from January 5, 1970, to September 23, 2011, and on The Online Network (TOLN) from April 29 to September 2, 2013, via Hulu, Hulu Plus, and iTunes. Created by Agnes Nixon, All My Children is set in Pine Valley, Pennsylvania, a fictional suburb of Philadelphia, which is modeled on the actual Philadelphia suburb of Rosemont. The original series featured Susan Lucci as Erica Kane, one of daytime television's most popular characters. The title of the series refers to the bonds of humanity. All My Children was the first new network daytime drama to debut in the 1970s. Originally owned by Creative Horizons, Inc., the company created by Nixon and her husband, Bob, the show was sold to ABC in January 1975. The series started at a half-hour in per-installment length, then was expanded to a full hour on April 25, 1977. Earlier, the show had experimented with the full-hour format for one week starting on June 30, 1975, after which Ryan's Hope premiered. From 1970 to 1990, All My Children was recorded at ABC's TV18 at 101 West 67th St, now a 50-story apartment tower. From March 1990 to December 2009, it was taped at ABC's Studio TV23 at 320 West 66th Street in Manhattan, New York City, New York. In December 2009, the locale for taping the series moved from Manhattan to less costly Los Angeles, California. The show was then produced in Stages 1 and 2 at the Andrita Studios in Los Angeles, California, from 2010 to 2011, and then at the Connecticut Film Center in Stamford, Connecticut. All My Children started taping in high definition on January 4, 2010, and began airing in high definition on February 3, 2010. All My Children became the third soap opera to be produced and broadcast in high definition. At one point, the program's popularity positioned it as the most widely recorded television show in the United States. Also, in a departure from societal norms at the time, All My Children, in the mid-1970s, had an audience that was estimated to be 30% male. The show ranked No. 1 in the daytime Nielsen ratings in the 1978–79 season. Throughout most of the 1980s and into the early 1990s, All My Children was the No. 2 daytime soap opera on the air. However, like the rest of the soap operas in the United States, All My Children experienced unprecedented declines in its daytime ratings during the 2000s. By the 2010s, it had become one of the least watched soap operas in daytime television. On April 14, 2011, ABC announced the cancellation of All My Children after a run of 41 years due to low ratings. On July 7, 2011, ABC sold the licensing rights of All My Children to third-party production company Prospect Park with the show set to continue on the internet as a series of webisodes. The show taped its final scenes for ABC on August 30, 2011, and its final episode on the network aired on September 23, 2011, with a cliffhanger. On September 26, 2011, the following Monday, ABC replaced All My Children with a newly debuted talk show The Chew. Prospect Park had suspended its plan to revive the series on November 23, 2011, due to lack of funding and unsuccessful negotiation with the union organizations representing the actors and crews. On January 7, 2013, Prospect Park officially brought back its project to restore All My Children as a web series. The show taped its first scenes for Prospect Park TOLN on February 18, 2013, and its first episode on the network aired on April 29, 2013. However, the new series faced several behind-the-scene obstacles throughout its run. On November 11, 2013, several All My Children cast members announced that Prospect Park had closed production and canceled the series again. ABC regained the rights to All My Children in December 2016. Nixon became head writer for Another World in 1965, and decided to use a few ideas from her All My Children bible. In one specific case, she used the model of the Erica Kane character to create a brand new Another World character named Rachel Davis. Nixon said Rachel was Erica's "precursor to the public ... [What] Erica and Rachel have in common is they thought if they could get their dream, they'd be satisfied... But that dream has been elusive", Nixon said. All My Children debuted on January 5, 1970, replacing the canceled game show Dream House. Rosemary Prinz was signed on to be the "special guest star" for six months, playing the role of political activist Amy Tyler. Prinz was well known for her role of Penny Hughes on As the World Turns in the 1950s and 1960s, and she was added to the show to give it an initial boost due to her name value. 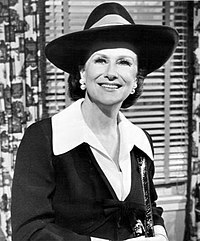 From 1970 and into the 1980s, the show was either written by Nixon herself or by her protégé, Wisner Washam. He was groomed by Nixon to eventually take over the reins in the 1980s while she focused on other endeavors, which included creating and launching Loving in 1983. All My Children's first success was its focus on young love. ABC wanted a soap opera that would bring in young viewers, and slowly the program was accomplishing that. The show's ratings did not start out strong, however. In its first year on the air, it ranked No. 17 out of 19 soap operas. Despite this, its audience grew with each passing year. In May 1972, the character of Erica Kane Martin became the first television character to undergo a legal abortion. Making the abortion particularly controversial is Erica's reason for doing it, not because of her jeopardized health, but rather because she did not want to gain weight and lose her modeling job. The abortion story received much media attention, especially since it preceded the Roe vs. Wade decision by nearly a year. Within the story, Erica developed a potentially fatal infection after having the abortion, and the switchboards at ABC lit up with calls from doctors and nurses, offering their medical opinions on how best to treat the character's case. By the late 1970s, the show had risen to the top of the ratings. One reason for the rise was the arrival of teenage prostitute Donna Beck (Candice Earley). Her relationship with the handsome Dr. Chuck Tyler breathed life into the show and captivated fans. Other new additions are the arrivals of aristocratic Palmer Cortlandt (aka Peter Cooney) (James Mitchell), his somewhat creepy housekeeper Myra Murdock (Elizabeth Lawrence), and his overprotected daughter Nina (Taylor Miller), who, to Palmer's chagrin, entrances Dr. Cliff Warner (Peter Bergman). Palmer does everything in his power to break up the couple, including telling Nina she is going blind due to her diabetes. Palmer teams up with Cliff's past flame, nurse Sybil Thorne (Linda Gibboney), who confronts Cliff about fathering her son, but this is temporary; Sybil is murdered and Cliff is arrested for the crime, which actually was committed by Sean Cudahy (Alan Dysert). During the murder trial, Nina is astonished to learn that her mother, Daisy Cortlandt (Gillian Spencer), whom she believes to be dead, is, in fact, alive and living in Pine Valley as Monique Jonvil. To everyone's complete shock, Myra acknowledges that Daisy is her daughter. All My Children also found memorable villains in Billy Clyde Tuggle (Matthew Cowles) and Ray Gardner (Gil Rogers). All My Children had always aired in color since its 1970 debut. The episodes were initially only saved for a short time on cartridge tapes and were eventually erased in order to tape other productions. Beginning in 1976, all the episodes were saved on cartridge tape and then digitally since the late 1990s. A few early episodes were saved on kinescope in black and white, one of which aired on ABC in 1997 on a special "A Daytime To Remember", which showcased all TV shows that aired on ABC Daytime. But there are no known pre-1976 episodes to be still in existence on tape. Nixon personally owned all the early episodes on monochromatic kinescopes. When ABC purchased the rights to All My Children in late 1974, it also received the kinescopes from Nixon with a promise that the network will archive them. However, that proved to be short-lived, because most of them were either lost in a warehouse fire or were erased. As mentioned above, a few early episodes survive. For older appeal, Jenny and Tad's natural mother Opal (Dorothy Lyman) was also added to the canvas, where she opens the Glamorama salon and spa. Opal greatly showcased All My Children's attempt at humor and satire. Also introduced in the 1980s were powerful businessman Adam Chandler and his identical twin brother Stuart (both played by David Canary), the first arrival of members of the Chandler family. Adam became cited as one of the "most powerful male figures in television", which was contrasted by Stuart's kind, generous, and honest personality. Erica began to take on a larger-than-life role by the 1980s. This is evident with her writing an autobiography, "Raising Kane", and turning it into a motion picture. When her presumed half-sister Silver (Deborah Goodrich) accuses her of murdering Kent Bogard (Michael Woods, Lee Godart), her former lover and boss, she goes on the run, fleeing to the Hollywood Hills. She does all this while posing as a sister. Controversy was prompted in 1987 with the arrival of Cindy Parker (Ellen Wheeler), who would later fall in love with Stuart. The character was revealed to have AIDS. Through visits by now-Dr. Angie Hubbard, the show educated the public on how the disease was spread and how to prevent it. Cindy had contracted HIV from her husband, Fred, played by Mark Morrison who contracted it from sharing needles for drug use. Cindy is attacked by a vigilante hate group led by her niece, Skye Chandler. The tragedy of the attack shows the extremes of violence that occur every day to victims of the disease. Cindy marries Stuart and he adopts her son, Scott. She dies early in 1989 in one of the show's most watched episodes. ABC wanted changes at All My Children. The show was getting about 6.5 million viewers per episode, but there was sentiment that the program had lost its unique sense of humor and was simply copying other soaps with action/adventure storylines. Efforts were made to bring the show back to the glory days of the late 1970s and early 1980s. McTavish was also instrumental in a major but still popular retroactive continuity (retcon) storyline in 1993. Shortly after being introduced, the audience soon learns Kendall Hart (Sarah Michelle Gellar) is actually Erica's long-lost daughter. Kendall was conceived after Erica was raped on her 14th birthday by her father's actor friend Richard Fields. After she became pregnant, Erica gave her baby up for adoption to the Harts, a couple from Florida. Kendall comes to Pine Valley after finding out her birth mother is the famous Erica Kane. Kendall longs for Erica's approval but is also angry over her perceived feelings of being 'abandoned' at birth and comes to want payback against her mother. Although they try to make their family work at first, Kendall acts out  and mother and daughter experience a painful, strained, and complicated relationship during this time in the series. The popular Gellar was proclaimed by some "as the second coming of Erica" in her two years as Kendall Hart from 1993–1995 but left the show to pursue other acting opportunities. Producers ended up waiting at least six years before even contemplating to recast the role (which eventually went to Alicia Minshew in 2002). Nixon decided to write a story that would rejuvenate the show and be socially relevant at the same time. This resulted in the series revealing Erica's daughter Bianca as a lesbian. Within the series, Bianca admits the truth to her mother in December 2000. Although initially controversial, the storyline was praised by fans and critics. Bianca emerged as a breakout character and lesbian icon. The show found additional success in the pairing of newcomers Leo and Greenlee (Josh Duhamel and Rebecca Budig). On January 5, 2010, All My Children celebrated its 40th anniversary with an episode structured like a documentary and hosted by character Hayley Santos. It featured appearances by characters Palmer Cortlandt, Nina Warner, Maria Santos Grey, Brooke English, Greg Nelson, Bianca Montgomery, Mateo Santos, and Lily Montgomery. It was also the final episode for characters Joe and Ruth Martin, who retired to Florida, and the final appearance for Palmer, since actor James Mitchell died a little over weeks after the episode aired. In January 2011, Debbi Morgan said that she would take a leave of absence from the show. She said it was for personal reasons and on January 14, 2011, she released to the public that she has been diagnosed with Lyme Disease. She returned during the second week of February and her first episode aired on March 8, 2011. On February 10, 2011, as part of her 25th (and farewell) season, Oprah Winfrey invited All My Children's Susan Lucci, Debbi Morgan, Darnell Williams, and Michael E. Knight, along with General Hospital's Luke and Laura (Anthony Geary and Genie Francis) and The Young and the Restless's Mrs. Chancellor (Jeanne Cooper) to The Oprah Winfrey Show. As a surprise, Winfrey shocked Lucci and the rest of the crowd by bringing back all of Erica's husbands. During February 2011, the TV Land sitcom Hot in Cleveland and All My Children did a crossover event. On the 16th, and February 23, Lucci, Michael E. Knight, and Darnell Williams made a guest appearance on the show. On the 24th, Wendie Malick guest-starred. The new cast of Prospect Park's All My Children revival. (l-r) Heather Roop, Ray MacDonnell, Jordi Vilasuso, Francesca James, Darnell Williams, Eric Nelsen, Debbi Morgan, Lindsay Hartley, Cady McClain, Jill Larson, Julia Barr, Vincent Irizarry, Denyse Tontz, David Canary, Sal Stowers, Robert Scott Wilson, Thorsten Kaye, Eden Riegel, Jordan Lane Price, and Ryan Bittle. Since the series began in 1970, the show has been set in Pine Valley, Pennsylvania, a fictional suburb of Philadelphia. The town exists in the same fictional universe as other serial settings such as Llanview (One Life to Live), Port Charles (General Hospital, Port Charles, The Young Marrieds), New York City (Ryan's Hope) and Corinth (Loving). In 2000, All My Children, was featured in a major crossover event, that encompassed all the then existing ABC Daytime soap lineup. Linda Dano brought her One Life to Live character Rae Cummings, to Pine Valley, where she connected with her mother Myrtle Fargate. It was also revealed during that storyline, that longtime existing All My Children character Skye Chandler, was Rae's daughter. Skye, who had spent time on One Life to Live from 1999-2001, then followed Rae to Port Charles, the setting of the soaps General Hospital and Port Charles, where she became a member of the Quartermaine family, and made appearances until 2012. All My Children has featured several crossovers with other ABC soaps, including an extensive 2004 'baby switch' storyline with One Life to Live which featured crossovers of over 20 characters between the two shows. In 2011, AMC did a comedic crossover with the TV Land comedy Hot in Cleveland, in which fictitious actress Victoria Chase (portrayed by Wendie Malick but credited as Chase) does a cameo appearance on AMC alongside Susan Lucci. In the Hot in Cleveland storyline, Chase and Lucci (portrayed as herself) are daytime-TV contemporaries and rivals. In 2017, All My Children character Alexandra Devane appeared on General Hospital, where she masqueraded as her sister Anna Devane. January 15, 1995: AMC 25th Anniversary (#56, 10.3/15 rating/share and 16.0 million viewers) (Competition: Murder, She Wrote on CBS (#16, 14.5/21 rating/share and 20.8 million viewers) and seaQuest DSV on NBC (#61, 9.7/14 rating/share and 16.5 million viewers)). All My Children had an overall increase of 495,000 viewers from the previous week, making it the second most watched daytime soap after The Young and the Restless. All My Children's final episode on ABC beat the final episodes of the two previous canceled soaps on CBS: As the World Turns and Guiding Light. "All My Children" had its biggest week to week gain in total viewers since the week of December 27, 2004, when it gained 521,000 viewers. During the week of September 19, 2011, "AMC" gained 499,000 viewers. All My Children's first online episode premiered with impressive numbers. On iTunes the show was the most downloaded TV season of the day, the 4th most downloaded episode of the day and on Hulu it was the most watched show of the day. As of 2013[update], new episodes are available for purchase worldwide via the iTunes store. In Australia, All My Children aired on free to air channel 7TWO at 11 am weekdays. 7TWO screened episodes from 2007. It had previously aired on Network Ten in the late 1980s. In France, All My Children, under the title La Force du Destin (Strength of Destiny) was aired on TF1 in March 2003, with episodes eight years behind the US during a week at 2:30 pm (after The Young and the Restless). But, because of a fall of the audience, the show was canceled. In Italy, All My Children, under the title La valle dei pini (Pine Valley), started to air on Canale 5 in September 1985 at 2:30 pm, with episodes four years behind the US in January 1987, it was moved to another channel, Rete 4, always at 2:30 pm At the end of the decade, La valle dei pini began airing in late afternoon (and from September 1990 with only half US episode each evening), after a bunch of Latin American telenovelas and before General Hospital. Then, in September 1991, the show was moved to 9:00 am All My Children was canceled in May 1992, with episodes at that time six years behind the US. As of 2012[update], New Zealand, started airing All My Children on TV3 1 pm weekdays. TV3 airs episodes from 2010. TV3 has reportedly canceled their contract with ABC NETWORK after learning of the show's demise. All My Children was broadcast in South Africa on SABC3 from 2001 to 2014. For most of its run it was broadcast weekday afternoons, but for its last few years was broadcast weekday mornings. Episodes were four years behind the US. In Canada, starting April 29, 2013, new episodes of the revived series are available on cable network FX Canada at noon every Monday through Thursday, followed by new episodes of One Life to Live at 12:30, with same-day repeats airing at 5:00 pm (followed by One Life to Live at 5:30 pm). It previously aired on CTV Two 12 p.m. PT, 1 p.m. ET in Canada until its 2011 cancellation and Citytv stations in Calgary CKAL-TV, Edmonton CKEM-TV, and Winnipeg CHMI-TV. All My Children aired on CTV from 1970 to 1982 and aired on the CBC Television network from 1982 to 1988. In Israel, All My Children was broadcast on channel 2 from 1999 to 2005 at 4:30 after The Bold and the Beautiful; in 2006, AMC moved to channel 1 until it was cancelled in 2007. The show started from 1994 episodes until 1997. 1981 "Outstanding Drama Series Writing Team"
1988 "Outstanding Drama Series Writing Team"
1995 "Outstanding Drama Series Directing Team"
1995 "Outstanding Technical Direction/Electronic Camera/Video Control"
1995 "Outstanding Live and Tape Sound Mixing and Sound Effects"
1996 "Outstanding Drama Series Writing Team"
1997 "Outstanding Drama Series Writing Team"
1998 "Outstanding Drama Series Writing Team"
1998 "Outstanding Multiple Camera Editing"
1998 "Outstanding Live and Direct To Tape Sound Mixing"
1999 "Outstanding Music Direction And Composition"
2000 "Outstanding Art Direction/Set Decoration/Scenic Design"
2000 "Outstanding Achievement in Hairstyling"
2001 "Outstanding Achievement in Multiple Camera Editing"
2001 "Outstanding Achievement in Hairstyling"
2002 "Outstanding Achievement in Casting"
2002 "Outstanding Achievement in Costume Design"
2002 "Outstanding Achievement in Technical Direction/Electronic Camera/Video Control"
2002 "Outstanding Achievement in Music Direction and Composition"
2003 "Outstanding Drama Series Directing Team"
2003 "Outstanding Art Direction/Set Decoration/Scenic Design"
2003 "Outstanding Achievement in Casting"
2003 "Outstanding Achievement in Costume Design"
2003 "Outstanding Achievement in Hairstyling"
2003 "Outstanding Achievement in Lighting Direction"
2003 "Outstanding Achievement in Makeup"
2003 "Outstanding Achievement in Music Direction and Composition for a Drama Series"
2005 "Outstanding Achievement Multiple Camera Editing for a Drama Series"
2005 "Outstanding Achievement in Makeup"
2005 "Outstanding Live & Direct To Tape Sound Mixing"
2007 "Outstanding Achievement in Technical Direction/Electronic Camera/Video Control"
2008 "Outstanding Achievement in Technical Direction/ Electronic Camera/Video Control"
2009 "Outstanding Art Direction/Set Decoration/Scenic Design"
2009 "Outstanding Live & Direct To Tape Sound Mixing"
2010 "Outstanding Achievement in Costume Design"
2012 "Outstanding Live & Direct To Tape Sound Mixing"
2012 "Outstanding Achievement Multiple Camera Editing for a Drama Series"
1980 "Outstanding Design For a Daytime Drama Series"
1980 "Outstanding Achievement in Technical Excellence for a Drama Series"
In 2010, All My Children was nominated for a GLAAD Media Award for "Outstanding Daily Drama" during the 21st GLAAD Media Awards. Neal Bell, Clarice Blackburn, Bettina F. Bradbury, Craig Carlson, Cathy Chicos, Hal Corley, Christina Covino, Carolyn Culliton, William Delligan, Judith Donato, Caroline Franz, Sharon Epstein, Charlotte Gibson, Kenneth Harvey, David Hiltrand, Janet Iacobuzio, Anita Jaffe, Frederick Johnson, Susan Kirshenbaum, Kathleen Klein, N. Gail Lawrence, Mimi Leahy, Kathleen Klein, Karen Lewis, Taylor Miller, Victor Miller, Jane Owen Murphy, Juliet Law Packer, Michelle Patrick, John PiRoman, Pete T. Rich, John Saffron, Courtney Simon, Peggy Sloan, Elizabeth Smith, Gillian Spencer, Millee Taggart, Ralph Wakefield, Elizabeth Wallace, Addie Walsh, Mary K. Wells, Jack Wood, Rodney Christopher, Laura Siggia, Moses Thomas Greene, Wisner Washam, Marlene McPherson, Elizabeth Snyder, Lisa K. Connor, Rebecca Taylor, and Suzanne V. Johnson. The game company TSR, Inc. introduced the All My Children game in 1985, based on the daytime drama. The game sold more than 150,000 copies. A DVD was released on January 24, 2004, titled Daytime's Greatest Weddings which contained All My Children and other daytime soaps' weddings. A line of perfume and body lotion was produced based on this show as well. Long since discontinued though pieces may be able to be acquired from personal sale sites. ^ H.W. Wilson Company (1986). Current Biography. H.W. Wilson Company. pp. 128 (specific page). ^ HARRISON, NANCY (June 23, 1991). "Susan Lucci, 11 Times a Nominee, 8 Times a Bride, Up for Emmy Again". The New York Times. Retrieved 2007-10-27. ^ "Rumor no more: All My Children relocating to Los Angeles". SoapCentral. August 4, 2009. Retrieved August 4, 2009. ^ "All My Children" and "One Life to live" to Go HD and Get More Space as Part of Relocation, Daytime Confidential, August 4, 2009. ^ "One Life to Live announcement". ABC Network. July 7, 2011. Archived from the original on October 21, 2012. Retrieved January 11, 2013. ^ Rice, Lynette (November 23, 2011). "'One Life to Life' and 'All My Children' dead: Online plans canceled". Entertainment Weekly. Retrieved 2013-01-11. ^ a b c d Andreeva, Nellie (January 7, 2013). "Prospect Park Confirms 'All My Children' & 'One Life To Live' Revivals, Production To Begin in February". ^ "One Life To Live, All My Children Set Online Premiere Date; Roger Howarth Returning To OLTL". Access Hollywood. March 11, 2013. Retrieved 2013-03-11. ^ "Soap opera 'All My Children' washed up?". LA Times. November 13, 2013. Retrieved 2014-01-06. ^ a b Stanhope, Kate (November 11, 2013). "All My Children Dead (Again), Cast Members Say". TV Guide. Retrieved November 11, 2013. ^ a b "'All My Children' Canceled: Online Soap Not Returning". Huffington Post. November 12, 2013. Retrieved November 12, 2013. ^ a b Eades, Chris (2016-12-02). "Prospect Park's Lawsuit Dismissed — ALL MY CHILDREN and ONE LIFE TO LIVE Rights Back at ABC!". ABC Soaps In Depth. Retrieved 2018-01-18. ^ Simon, Ron; Thompson, Robert J.; Spence, Louise; Feuer, Jane (1997). Morton, Robert, ed. Worlds Without End: The Art and History of the Soap Opera. New York City: Harry N. Abrams. pp. 34–36. ISBN 978-0-8109-3997-4. ^ a b c d "NIXON, AGNES. U.S. Writer-Producer". museum.tv. Archived from the original on July 13, 2007. Retrieved 2007-07-06. ^ Callahan, Michael (8 Jun 2007). "Legends: The Original Desperate Housewife". Philadelphia Magazine. ^ Astrachan, Anthony (March 23, 1975). "Life Can Be Beautiful/Relevant". New York Times Times. ^ Di Lauro, Janet. "Supercouples: A Relic From the '80s or Still Alive and Kissing?". soapoperadigest.com. Archived from the original on September 6, 2010. Retrieved 2007-09-06. ^ Amatangelo, Amy (January 17, 2008). "Daytime's '80s 'supercouple' returns to 'All My Children'". The Boston Herald. Retrieved 2008-01-20. ^ "Hot Plot's: AMC's Top Summer Storylines". Soap Opera Digest. Archived from the original on September 6, 2010. Retrieved 2007-07-07. ^ Henry Jenkins; Tara McPherson; Jane Shattuc (2002). Hop on Pop: The Politics and Pleasures of Popular Culture. Duke University Press. p. 792 pages (specific page). ISBN 0-8223-2737-6. ^ a b c C. Lee Harrington (2003). Homosexuality on All My Children: transforming the daytime landscape. Blackwell Publishing. Archived from the original on May 17, 2011. ^ a b Kathleen Tracy (2003). The Girl's Got Bite: The Original Unauthorized Guide to Buffy's World ... St. Martin's Press. p. 384. ISBN 0-312-31258-X. ^ West, Abby. "17 Great Soap Supercouples: Tad and Dixie". Entertainment Weekly. Archived from the original on February 1, 2008. Retrieved 2008-01-29. ^ West, Abby. "17 Great Soap Supercouples: Erica and Dimitri". Entertainment Weekly. Archived from the original on February 1, 2008. Retrieved 2008-01-29. ^ a b c d Branco, Nelson. "The plot to save 'All My Children': New head writers Barbara Esensten and James Harmon Brown dish on recasting Babe, Dixie's death, and creating a diverse canvas". TV Guide. Archived from the original on October 13, 2007. Retrieved 2007-11-06. ^ "AMC's Bianca Storyline Applauded". SoapCentral. 2001. Archived from the original on November 5, 2007. Retrieved 2007-10-04. ^ a b Kregloe, Karman (March 23, 2006). "Soaps Come Clean About Gay Teens (page 3)". AfterElton.com. Archived from the original on June 11, 2007. Retrieved 2007-08-09. ^ a b Healy, Patrick D. (February 24, 2005). "After Coming Out, a Soap Opera Heroine Moves On". The New York Times. Retrieved 2007-10-14. ^ Yimm, Lisa (April 2004). "Olga Sosnovska, AMC's Unlikely Lesbian Icon". AfterEllen.com. Archived from the original on January 16, 2008. Retrieved 2008-04-07. ^ "Best New Couple". Soap Opera Digest. 2000. ^ Aspenson, Carolyn (February 5, 2009). "Redefining the Super Couple". eyeonsoaps.net. Archived from the original on June 27, 2009. Retrieved 2009-03-05. ^ a b "Hendrickson To Return as "Maggie"". www.soapcentral.com. January 10, 2002. Retrieved 2007-08-12. ^ "SON for week of April 26th". soapoperanetwork.com. April 26, 2007. ^ "Fans Cry Foul Over Bianca's Latest Loss!". Soaps in Depth. December 25, 2001. Archived from the original on February 28, 2006. Retrieved 2008-02-09. ^ "Culliton Out As AMC's Head Writer". SoapCentral. October 25, 2002. Retrieved 2007-08-12. ^ R. Coleridge, Daniel (June 22, 2006). "Rihanna to appear on 'All My Children'. Singer would walk down a red carpet featuring reporters playing themselves". Associated Press. Retrieved 2009-07-26. ^ R. Coleridge, Daniel (February 28, 2007). "Soaps News: All My Children Head Writer Fired!". TV Guide. ^ "AMC features transgender role Rocker Zarf is man seeking surgery to become woman". Associated Press. December 5, 2006. Retrieved 2007-12-30. ^ Logan, Michael. "Michael Logan's Worst of 2007". TV Guide. Archived from the original on December 16, 2008. Retrieved 2008-02-10. ^ "The Nielsens". Soap Opera Weekly. February 27, 2007. p. 5. ^ "Hit... Or Miss!". Soap Opera Weekly. February 27, 2007. p. 12. ^ Mitovich, Matt Webb. "Soaps News: Budig's Back on AMC! Plus, an Angie/Jesse Reunion?!". TV Guide. Archived from the original on December 8, 2008. Retrieved 2008-01-20. ^ Hirsch, Lynda (January 16, 2008). "Rebecca Budig Returns to All My Children". Boston Herald. Archived from the original on September 7, 2010. Retrieved 2008-07-14. ^ "Rebecca Budig returns to 'All My Children'". People.com. December 14, 2007. Retrieved 2008-07-14. ^ a b "Rebecca Budig returns as Greenlee on 'All My Children'". texarkanagazette.com. Archived from the original on December 8, 2008. Retrieved 2008-07-14. ^ Hirsch, Lynda. "Rebecca Budig Bringing Greenlee Back to "All My Children"". National Ledger. Archived from the original on December 8, 2008. Retrieved July 14, 2008. ^ "Rebecca Budig's Comeback Q&A". Abc.com. Archived from the original on July 4, 2008. Retrieved 2008-07-14. ^ Hinsey, Carolyn (December 14, 2007). "Soap Dish: Rebecca Budig is returning to 'All My Children'". New York Daily News. Archived from the original on July 9, 2008. Retrieved 2008-07-14. ^ "Budig Returns to Role of Greenlee". SoapCentral. Archived from the original on December 17, 2007. Retrieved 2007-12-18. ^ "Soap Opera Digest, Sabine Singh interview". Soap Opera Digest. 2007. ^ "Real-life Iraq war vet cast on 'All My Children'". SoapCentral. Retrieved 2013-12-04. ^ "One Life to Live: Big Returns and Plots For 40th Anniversary!". Soaps.com. June 10, 2008. Archived from the original on August 5, 2008. Retrieved August 5, 2008. ^ Logan, Michael (June 11, 2008). "Soaps News: One Life Celebrates No. 40 with Blasts from the Past". TVGuide.com. Archived from the original on August 1, 2008. Retrieved August 5, 2008. ^ "One Life to Live recap (7/21/08, 40th Anniversary)". Soaps.com. 2008-07-21. Retrieved 2013-12-04. ^ "7/22/08, 40th Anniversary of One Life to Live". Soaps.com. Retrieved 2013-12-04. ^ "AMC Recap, 2/16/09". Soaps.com. 2009-02-16. Retrieved 2013-12-04. ^ "Soap features daytime TV's first lesbian wedding". Cnn.com. 2009-02-16. Retrieved 2013-12-04. ^ Dan J Kroll; Liz Masters (March 5, 2010). "Riegel didn't want to play Bianca, recast coming". Soap Opera Central. Archived from the original on March 7, 2010. Retrieved 2010-04-04. ^ Levinsky, Mara (March 30, 2010). "Wham, BAM!". Soap Opera Digest. Retrieved 2010-04-04. ^ Logan, Michael (May 13, 2010). "All My Children Finds Its New Bianca". TV Guide. Retrieved 2010-05-13. ^ "New "All My Children" Writing Team Hire a Curious Choice". National Ledger. January 23, 2010. Archived from the original on September 7, 2012. Retrieved February 3, 2010. ^ "Kreizman, Swajeski named co-head writers". SoapCentral. Retrieved 2013-12-04. ^ "James Mitchell dead at 89". SoapCentral. Retrieved 2013-12-04. ^ "Twitter: soapsindepthabc: Great news kids: #AMC is NOT". Twitter.com. Retrieved 2013-12-04. ^ Lewis, Errol (2011-08-12). "SOAPnet Reveals Post 'All My Children' Schedule, Slots 'Days of our Lives' into Primetime for the First Time". Soap Opera Network. Retrieved 2013-12-04. ^ "Zap2it Inside the Box: "Hoover pulls ads from ABC due to cancellation of 'All My Children' and 'One Life to Live'", April 19, 2011". Blog.zap2it.com. April 19, 2011. Archived from the original on February 22, 2014. Retrieved December 4, 2013. ^ Andreeva, Nellie (April 18, 2011). "Hoover Pulls ABC Advertising In Protest Over Cancellations Of 'AMC' & 'OLTL'". Deadline. Retrieved 2013-12-04. ^ "Hoover's official Facebook page: "To Our Loyal ABC Soap Fans", April 18, 2011". Facebook.com. Retrieved 2013-12-04. ^ "David Canary, Lee Meriwether, Julia Barr & Ray MacDonnell Returning to 'All My Children'". Aoltv.com. 2011-07-18. Retrieved 2013-12-04. ^ "Sarah Michelle Gellar returns to All My Children". Cbc.ca. Retrieved 2013-12-04. ^ "Sarah Michelle Gellar Cameo on All My Children 9-21-2011". YouTube. Retrieved 2018-01-18. ^ a b Seidman, Robert. "It's Official: ABC Licenses "All My Children" and "One Life to Live" To Prospect Park; Series to Continue Online". TVBytheNumbers.com. Archived from the original on July 10, 2011. Retrieved July 7, 2011. ^ Andreeva, Nellie. "'All My Children', 'One Life To Live' To Return To TV? Soaps Shopped To Cable Networks". Deadline Hollywood. Retrieved 2013-12-04. ^ "All My Children, One Life to Live shopped to cable". TV Series Finale. Retrieved 2013-12-04. ^ "Prospect Park Begins Official Negotiations with 'All My Children' Actors". Soap Opera Network. 2011-09-15. Retrieved 2013-12-04. ^ Schwankert, Steven (September 19, 2011). "Cameron Mathison, Lindsay Hartley Join Online 'All My Children' Cast". The Hollywood Reporter. ^ Andreeva, Nellie. "Prospect Park Deals With Guild/Union Issues As It Eyes Q1 2012 Relaunch Of ABC Soaps". Deadline Hollywood. Retrieved 2013-12-04. ^ "New Episodes of 'All My Children' Will Premiere Online in January". Reuters. 2011-09-28. Retrieved 2013-12-04. ^ a b "Prospect Park Puts AMC On Hold!". Abc.soapsindepth.com. 2011-11-10. Retrieved 2013-12-04. ^ a b Weisman, Jon (November 10, 2011). "'All My Children' online reboot in holding pattern". Variety. ^ "Prospect Park Cancels Plans To Put 'One Life To Live,' 'All My Children' Online". Access Hollywood. November 23, 2011. Retrieved November 23, 2011. ^ Andreeva, Nellie. "WGAW & AFTRA React To 'AMC' & 'OLTL' Not Continuing Online: Don't Blame Us". Deadline Hollywood. Retrieved 2013-12-04. ^ "HOLIDAY MIRACLE: Prospect Park Back On Track To Revive 'All My Children' & 'One Life To Live' After Deals With SAG-AFTRA & DGA". Deadline Hollywood. Andreeva, Nellie. December 17, 2012. Retrieved December 17, 2012. ^ "Prospect Park Back in the Soap Mix". Soap Opera Digest. Bauer Media Group. December 17, 2012. Retrieved December 17, 2012. ^ "New EP For AMC". Soap Opera Digest. American Media, Inc. December 24, 2012. Retrieved December 24, 2012. ^ Fairman, Michael (March 7, 2013). "Alicia Minshew Set For One Episode Return To All My Children! Will More Follow?". Michael Fairman On-Air On-Soaps. Retrieved March 7, 2013. ^ "Prospect Park Finds New OLTL EP". Soap Opera Digest. American Media, Inc. December 27, 2012. Retrieved December 27, 2012. ^ "Vincent Irizarry Signs on For AMC Reboot". Soap Opera Digest. American Media, Inc. December 28, 2012. Retrieved December 28, 2012. ^ "Debbi Morgan To New AMC". Soap Opera Digest. American Media, Inc. January 6, 2013. Retrieved January 8, 2013. ^ Lewis, Errol (2013-02-25). "EXCLUSIVE! Ryan Bittle Is New JR Chandler on 'All My Children'". Soap Opera Network. Retrieved 2013-12-04. ^ Gore, Scotty (2013-02-25). "Robert Scott Wilson Officially Joins 'All My Children' 2.0". Soap Opera Network. Retrieved 2013-12-04. ^ Lewis, Errol (2013-02-25). "EXCLUSIVE! Eric Nelsen Cast as AJ Chandler on 'All My Children'". Soap Opera Network. Retrieved 2013-12-04. ^ a b Lewis, Errol (2013-02-25). "EXCLUSIVE! Jordan Lane Price NOT Miranda Montgomery; Soap Casts Denyse Tontz in Role". Soap Opera Network. Retrieved 2013-12-04. ^ Lewis, Errol (2013-02-25). "EXCLUSIVE! Sal Stowers is Cassandra Foster on 'All My Children'". Soap Opera Network. Retrieved 2013-12-04. ^ Barnes, Brooke (January 10, 2013). "Canceled ABC Soaps to be Reborn on the Web". New York Times. Retrieved January 10, 2013. ^ "Inside the Online Revival of 'All My Children', 'One Life to Live'". Variety. April 25, 2013. Retrieved April 26, 2013. ^ "'One Life to Live; and 'All My Children' to Stream Weekly Friday Recap Shows". TVByTheNumbers. April 17, 2013. Retrieved April 17, 2013. ^ "All My Children & One Life To Live Are Definitely Returning! Both Get Production Dates!". PerezHilton.com. 2013-02-12. Retrieved 2013-12-04. ^ "UK " All My Children and One Life to Live Shooting Schedules Revealed". ATV Today. 2013-02-16. Retrieved 2013-12-04. ^ "Canceled Soaps "All My Children" And "One Life To Live" Coming Back From The Dead On Hulu, iTunes". TechCrunch. 2013-01-25. Retrieved 2013-12-04. ^ Fairman, Michael (May 20, 2013). "FX Canada No Longer Carrying All My Children and One Life to Live! However, AMC & OLTL Are Now Available in Canada on iTunes!". Michael Fairman On-Air On-Soaps. Retrieved May 24, 2013. ^ Fairman, Michael (May 20, 2013). "All My Children and One Life to Live Premiere Episodes Now Up on You Tube Worldwide!". Michael Fairman On-Air On-Soaps. Retrieved May 24, 2013. ^ Fairman, Michael (May 24, 2013). "BREAKING NEWS: Agnes Nixon Reveals Prospect Park Names New Head Writers For AMC and OLTL!". Michael Fairman On-Air On-Soaps. Retrieved May 24, 2013. ^ "Prospect Park closes the book on All My Children and One Life to Live". soapcentral.com. Retrieved 2018-01-18. ^ "TOLN's Statistics for Premiere Week of All My Children & One Life to Live". Tvbythenumbers.zap2it.com. Retrieved 2013-12-04. ^ Eric Deggans, Times TV/Media Critic View all Articles. "Spicier 'All My Children,' 'One Live to Live' debut online | Tampa Bay Times". Tampabay.com. Retrieved 2013-12-04. ^ Todd Spangler Digital Editor, New York @xpangler (2013-04-25). ""All My Children," "One Life to Live": Prospect Park's online revival". Variety. Retrieved 2013-12-04. ^ a b Todd Spangler Digital Editor, New York @xpangler (2013-04-15). "Prospect Park Pacts With FX Canada for 'All My Children,' 'One Life'". Variety. Retrieved 2013-12-04. ^ "21st Annual GLAAD Media Awards – English Language Nominees". Gay & Lesbian Alliance Against Defamation. 2010. Archived from the original on January 22, 2011. Retrieved February 21, 2010. ^ Sedensky, Matt (2001-10-14). "Obituary: Jacqueline Babbin, 80, Producer In Theater, Films and Television". nytimes.com. Retrieved 2013-12-04. ^ "The History of TSR". Wizards of the Coast. Archived from the original on June 29, 2011. Retrieved August 20, 2005. ^ "Daytime's Greatest Weddings". Rotten Tomatoes. Archived from the original on September 11, 2010. Retrieved 2007-04-08. Soap Opera scripts, 1975–1989 Billy Rose Theatre Division, The New York Public Library.